My name is Jelena Popović and I come from Belgrade, Serbia. I started my academic journey in Belgrade where I finished my Bachelors and Masters in Biochemistry with a focus on allergen isolation and purification. Diving into immunology I joined the lab of Prof. Dr. Rolf Jessberger for my doctoral studies in dendritic cell development. I am looking forward to developing my knowledge and skills further in the Schraml lab. Johanna had a chance to talk about her latest data regarding a lymphoid origin of DCs and Natallia presented a poster about her developing story about the ontogeny of mononuclear phagocytes in the kidney. Here is what Natallia and Johanna say about the AKDC meeting: We are very happy to have attended this meeting, which took place in a nice castle in the middle of forest. We had the opportunity to hear about newest developments in the field of dendritic cell biology and are excited to have presented our own data in front of our colleagues. The friendly atmosphere of the meeting promoted a lively discussion with other PIs, postdocs and PhD students. After session time allows us to make new contacts and broaden our network. We are looking forward to next year's meeting. January 2019: "Understanding the Functional Properties of Neonatal Dendritic Cells: A Doorway to Enhance Vaccine Effectiveness?" Well done Nikos on his review "Understanding the Functional Properties of Neonatal Dendritic Cells: A Doorway to Enhance Vaccine Effectiveness?" published in Frontiers in Immunology. September kicked off really exciting as the 5th European Congress of Immunology was held in Amsterdam. Representing the lab, I participated with a poster presentation and had the opportunity to attend interesting talks that covered many aspects of the broad Immunology field. Particularly interesting were all the Keynote lectures, where renowned scientists presented their newest data and projects. These lectures were accompanied by similarly important ‘Late Breaking Hot Topic’ sessions, featuring a selection of soon-to-be-published papers from top scientific journals. In addition, the poster sessions were one of the main cores of the meeting and I really enjoyed presenting my work and critically discussing aspects of my project with fellow immunologists. Overall, it was a very interesting experience and I am looking forward to attending the next meeting, hopefully with more exciting data to present. In June, it was time for my first lab retreat in the gorgeous mountains of the Austrian Alps. We were lucky with the weather and had lots of opportunity to enjoy the sun on the terrace of our apartment together with the amazing views of the surrounding hills. Each lab members presented the progress of their project made in the last yearfollowed by fruitful and heated discussions about future ideas. In the evenings we enjoyed the food prepared by ourselves in teams and continued our discussions sometimes quite late into the night. Besides science, we found time to take a nice walk to the cute Straubinger Käsealm, where we filled our stomach with delicious local cheese and meat products (in the company of hundreds of wasps). Those who were crazier for hiking, such as Claudia and me, had an additional morning walk up to the nearby Sonnalm to watch the sunrise. May 2018: Congratulations to Johanna on publishing her first paper! Clec9a-Mediated Ablation of Conventional Dendritic Cells Suggests a Lymphoid Path to Generating Dendritic Cells In Vivo. In our most recent study, we set out to generate a DC depletion model based on deletion of Clec9a-expressing DC progenitors. To achieve this we crossed Clec9a-Cre mice to Rosa-lox-stop-lox-Diptheria Toxin reporter mice. We find that these mice show a complete loss of dendritic cell progenitors, but, to our surprise, do not exhibit a complete paucity of differentiated DCs. Specifically, cells with phenotypic characteristics of cDC2 populate the spleen and other periperhal organs of the mice. These cells are functionally and transcriptionally similar to cDCs in wild type control mice but show somatic rearrangements of Ig-heavy chain genes, characteristic of lymphoid origin cells. Our studies reveal a previously unappreciated developmental heterogeneity of cDCs and suggest that when myeloid cDC progenitors are impaired, the lymphoid lineage can generate cells with features of cDCs. We are currently investigating the origin and in vivo functions of the 'lymphoid' DC2 in further detail. In September our PhD students were invited by the IRTG914 to a Joint Scientific Retreat with the CiM-IMPRS Münster. This provided a great opportunity to present progress and get an overview about projects of others in form of a talk or a poster in a fantastic scientific atmosphere. 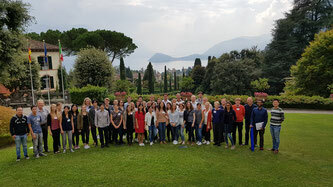 Keynote lectures by Jamey Marth (University of California, Santa Barbara, USA) and Emilio Hirsch (Torino) gave insight into their current research on inflammation at mucosal borders and scaffold functions of PI3Kgamma to fight airway infection, respectively. The trip was rounded up by a guided boat tour over lake como and a trip to Bellagio, where the beautiful landscape and Italian flair could be enjoyed. July 2017: Maria joins the lab. 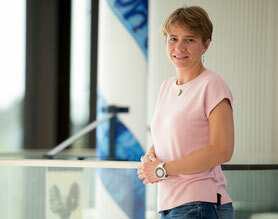 Maria Szente-Pasztoi is the newest member of our lab. Her project will focus on deciphering the functions of dendritic cells in early life. Maria is originally from Hungary but joins us from the Helmholtz Center in Braunschweig, Germany, where she did a first Postdoc in the lab of Jochen Hühn and studied dendritic cell development and function in the intestinal system. First Lab Retreat: June 26-29 2017 Annaberg/Austria. 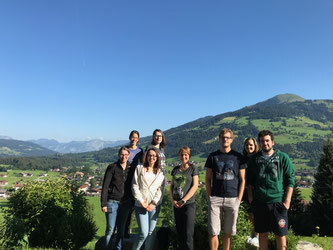 Our first lab retreat took place in the secluded Dachstein region of the Austrian Alps. Everyone presented an update on their projects. The relaxed environment of our holiday cottage allowed for lengthy and stimulating discussions leading to exciting ideas for current and future projects. Our scientific exchange was topped up by a scientific debate and some wonderful hiking in (not always) sunny weather. SFB 914: Retreat in Obergurgl, Austria, March 19-22 2017. 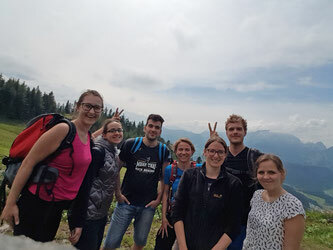 Johanna and Barbara joined the crew of the SFB 914 - Trafficking of Immune Cells in Inflammation, Development and Disease (http://www.sfb914.med.uni-muenchen.de/index.html) for a stimulating scientific exchange in Obergurgl, Austria. Great talks, great posters and a little time for skiing in the beautiful Austrian Alps.